EMI are to be congratulated on such adventurous programming, teaming these relatively lesser known concertos. It would have been so much easier and probably more commercially appealing to have recorded Walton�s much better known and more immediately appealing Violin Concerto rather than the one for Viola. But as Malcolm Macdonald says in his erudite booklet note, we have the opportunity to compare these two concertos. Although written ten years apart, they were composed when the two men were in their early twenties (Britten was, 26; Walton 25). Both follow a strikingly modern pattern, which had been used by Prokofiev for his First Violin Concerto of 1916-17. This broke the tradition of the great Classical and Romantic concertos. 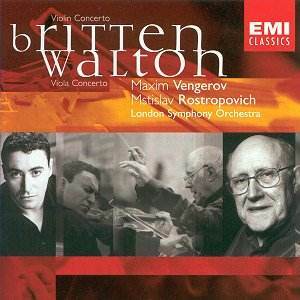 Both concertos follow a similar format: a moderately paced, predominantly lyrical first movement, a highly rhythmic central scherzo and a substantial, far lengthier (Britten, 15:10; Walton, 16:23 here) wide-ranging finale that sums of the argument of the whole work. Clearly the idea of the partnership of Maxim Vengerov and Mstislav Rostropovich is a powerful one. With producer John Fraser in the control room they do not disappoint. Nice that Fraser gets a prominent credit on the album after many years of excellent service for EMI supervising so many excellent recordings. Britten began work on his Violin Concerto in 1938 and completed it a few days after World War II broke out. It was premiered in New York on 29 March 1940 by the Spanish violinist Antonio Brosa, a refugee from Franco�s regime. The New York Philharmonic Orchestra was conducted by Barbirolli. Britten had met Brosa in the mid-1930s and had performed with him in the Barcelona in 1936 shortly before the outbreak of the Spanish Civil War. Appropriately, Britten uses Spanish rhythms and spectral hints of flamenco. The frequent restlessness and harsh voice of the orchestra, with, for example, its persistently nagging drum rhythm surely reflects the growing international tension of those days. The violin sings serenely, pacifyingly, then ultimately in lamentation.. Vengerov�s beautifully refined and eloquent reading explores depths of emotional involvement while he shows his usual quicksilver dexterity in the wild sardonic scherzo. Both conductor and soloist point up the Prokofiev inspiration of this movement. Throughout, Rostropovich provides a very colourful and dramatic accompaniment with the orchestral tapestry nicely balanced and transparent. It was Sir Thomas Beecham who suggested, in 1928, that Walton should write a Viola Concerto for Lionel Tertis. Christopher Palmer commented, "It was a work of such obvious mastery that it established Walton�s place in the vanguard of contemporary English music." At the time, however, Walton confessed that he knew little about the viola except that it made a rather awful sound! Nevertheless, he rose to the challenge and completed its composition at Amalfi south of the Bay of Naples. Alas, Tertis, returned it declaring it too modern. Understandably, Walton was deeply hurt. However the German viola player and composer Paul Hindemith agreed to premiere the Concerto. Tertis later apologized to Walton for having turned the work down and requested further performances of the work. In 1961 Walton revised the score reducing the size of the orchestra using double (rather than triple) woodwind, eliminating one trumpet and the tuba, but adding a harp. This is heard mainly in its lower registers to balance the viola adding a gentle anchoring ostinato, and heard most affectingly in the final Allegro moderato movement as a lovely ostinato figure. This might suggest lapping-water and, combined with the brilliant surrounding orchestral texture, conveys the colour and light of a Mediterranean coastline. For this recording, Vengerov uses a Stradivari �Archinto� viola of 1696 lent by the Royal Academy of Music, London from which he produces the most beautiful tone. I cannot remember this concerto�s sweet sad lyricism and romantic yearning more movingly communicated. The mercurial Rondo with its perky syncopations has attack and brio aplenty. Overall Vengerov and Rostropovich give a deeply satisfying reading, rising, with aplomb, to the Concerto�s challenges typified by wide intervals, looping arabesques, and irregular and syncopated rhythmic patterns. Memorable and deeply satisfying performances of two major British string concertos. Unhesitatingly recommended.